Washington has enjoyed a tradition of live military band concerts since 1863. The Army, Navy, Marine Corps, and Air Force bands perform on alternating days throughout the summer every year. Concerts are free, and no tickets are required. These performances honor those who have served our country and seek to inspire American patriotism. All concerts are on the West Front steps of the U.S. Capitol on the National Mall side. Concerts begin at 8 p.m. Check the Twitter account of each band on the day of the concert for any cancellations or schedule changes. If you'd like to sit during the concert, bring your own lawn chair. You can also bring food and drinks, but glass bottles and alcoholic beverages are not allowed. All dates are for summer 2018. The U.S. Navy Concert Band performs regularly on Monday evenings at the Capitol. The U.S. Navy Concert Band also performs on select Tuesday evenings at 7:30 p.m in the Concerts on the Avenue series at the Navy Memorial. 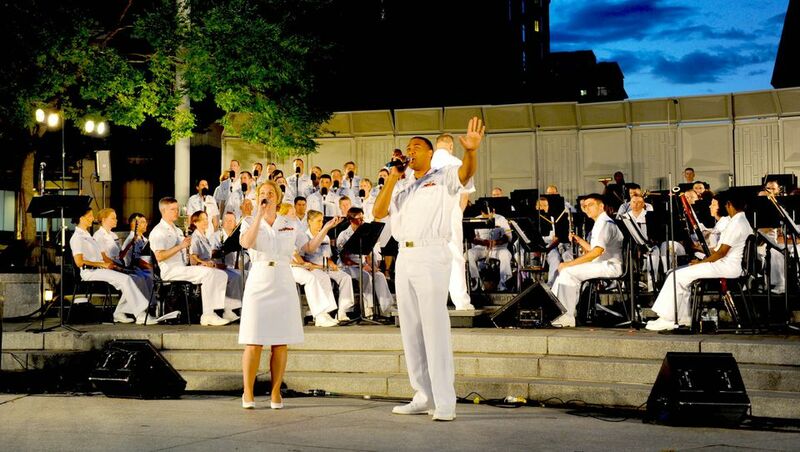 The Concert on the Avenue is a joint performance with all of the units of the Navy Band, including the Sea Chanters, Commodores, Country Current, and Cruisers. The U.S. Air Force Concert Band performs regularly on Tuesday evenings at the Capitol. The U.S. Air Force Concert Band also performs occasionally on Fridays evenings at 7:30 p.m. at the​ Air Force Memorial. The U.S. Air Force Concert Band also performs occasionally on Saturday evenings at 7 p.m. at National Harbor along the waterfront. The U.S. Marine Concert Band performs regularly on Wednesday and Thursday evenings at 8 p.m. at the Capitol. The Marine Band also performs regularly on Friday evenings at 8:45 p.m. at the Marine Barracks Washington, Eighth and I Streets SE. The U.S. Army Concert Band performs regularly on Friday evenings at the Capitol. The U.S. Army Concert Band also performs Twilight Tattoo on Wednesday evenings at 7 p.m. at Historic Fort Myer in Arlington, Virginia. It is an hour-long military pageant that features the Old Guard Fife and Drum Corps, the U.S. Army Drill Team, the U.S. Army Blues, and members of the U.S. Army Band Downrange. The concerts are held every Wednesday from April 25 through Aug. 1, with the exception of July 4 and 11.